If you’re like many other gunowners, the factory iron sight on your AR-15 may just not cut it for you. 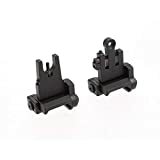 A good pair of backup iron sights (BUIS) can really help increase your accuracy and shooting ability, if you make the right purchase. There definitely are situations that where a BUIS is a great alternative to a scope or red dot. We’ve done the dirty work for you, and we’ve sifted through the best AR iron sights we could find online to put together this review for you. As always, we’ll let you know what we think are the best flip up iron sights for the everyday gun owner. Although most backup sights are traditionally iron, we do want to mention that some sights we reviewed here are not. Just because the sight isn’t made of iron doesn’t mean they won’t serve their purpose, so we don’t suggest skimming past any of these options. Materials – The Magpul Gen 2 Rear AR-15 Flip Up Sights are made in the United States, and they’re constructed of a tough polymer that is resistant to dings and scratches. The materials used are also lightweight, so this product will only add about three ounces to the overall weight of your rifle. It’s color injected molded, and it flips up and down for simple use. The Magpul Gen 2 Rear Backup Sight comes with a knob to adjust for windage, and it can fit most 1913 Picatinny railed hand guards. This product is simple in design, simple to use, and, although they’re not made of iron like many traditional backup sights, they’ll get the job done. Performance – The Magpul Gen 2 Rear Sights are the best flip up sights for anyone who needs a more economical choice for their wallet. Instead of being made of iron, it is made of polymer, which is still durable enough to resist impacts. Installing is incredibly easy and quick even without an AR tool kit, and the adjustments for windage could be done by a toddler (we’re not suggesting you let a toddler near your rifles)! With that in mind, you’re still not going to get to long lasting life like you may with an iron sight, but you can definitely get your money’s worth if you take care of your purchase. What we say – The Magpul Gen 2 Rear Sight are the cheapest option in this review, so it’s a great choice if you’re a first time buyer for a backup sight. A quick word of caution: it appears there are counterfeit versions on this sight being sold online, so be careful! We would suggest only purchasing this product from the Magpul company. 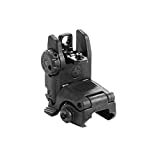 Materials – The Ozark Armament Front and Rear AR-15 Iron Sights come as a pair, and are fully backed by a United States support team and one year warranty. Both the front and rear sights have bodies constructed of milled aluminum with spring loading for quick deployment. The sights are made of iron, and provide a very narrow and accurate sight, with a precision aperture in the rear and a standard iron post for the front. They are fully adjustable for windage and elevation. The Ozark Armament Front and Rear AR Iron Sights together will only add about four ounces to the overall weight of your firearm. 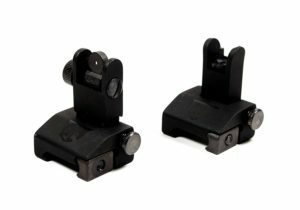 Performance – The Ozark Armament Front and Rear Sights are one of the best iron sights for AR-15 rifles because they’re compact, lightweight, and don’t include any frills. Since AR-15 rifles are intended to be standard and efficient, this iron sights will make a great addition. We also like how compact these sights are when folded down, and the spring loaded flip up action is pretty cool too. Our one complaint is that the adjustment knobs for windage and elevation may sometimes be a little flimsy. We suppose there are some compromises to be made for cheaper costing choices. 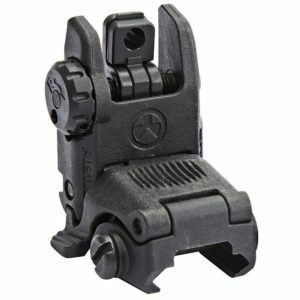 What we say – Again, this is another great option for anyone buying their first pair of backup sights. 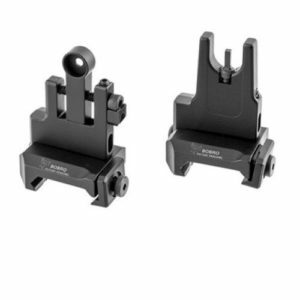 The Ozark Armament Front and Rear Sights are the best BUIS for anyone who wants the pair together for a cheap cost. They also make a sleek addition to your pristine AR 15. Materials – The Troy Industries Micro HK Front and Rear AR-15 Iron Sights are also made of a combination of stainless steel and aluminum. Depending on where you purchase them from, you can get them in black or a dark earth color. Their “micro” size makes them less than one and a half inches long, and their combined weight adds only about three ounces of additional weight to your weapon. These front and rear sights stay locked tight in place with the help of two locking detent balls, and they deploy quickly with spring action. They clamp to any Picatinny rail and are secured with a simple flat head screwdriver. 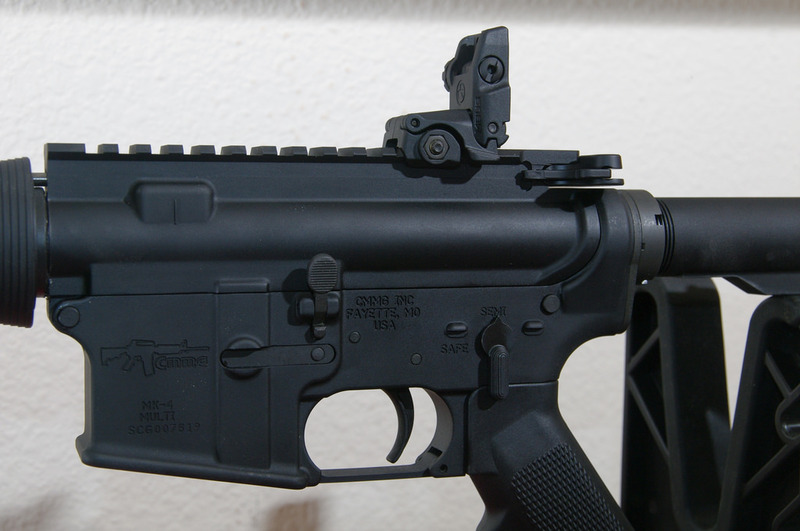 The apertures are the same height as the factory AR-15 sights, so there is very little adjusting to do. Performance – The Troy Industries Micro Front and Rear AR Iron Sights are certainly on the higher quality scale, and they’re easily one of the best flip up iron sights for AR-15 rifles. 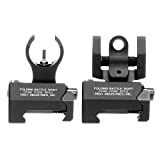 When testing this pair out, we did feel like the aperture on the rear sight was a little large for accuracy, but this could be more helpful to anyone who has trouble with such a small sight up close to their eye. Other than that, this pair of sights is durable and should last you through tons of use on a range. Again, compactness and lightweights features are key with the Troy Industries Micro Sights. What we say – This pair of front and rear sights definitely are a big leap in price from the previous two choices. Troy Industries is a very reliable company that many gunowners swear by. If you’re more serious about owning a good pair of BUIS, and you want to upgrade from the cheaper options, then this would be a great choice for you. Materials – The Bobro Engineering Low Rider AR-15 Flip Up Sights are the best AR iron sights for anyone who has additional lights and lasers on their rifles but still needs the room for a pair of front and rear backup sights. The specially designed low profile should solve that exact problem – the rear sight should not interfere with any other accessories, and the front sight is compact enough to mount under the front arm of an optic mount. Of course, they can also be used regularly on a standard sized rifle. They have traditional windage and elevation adjustment knobs, and they fully lock into position when flipped up. A simple press of a side button with release the front and rear sights, so they lay flat. Performance – The Bobro Engineering Low Rider Front and Rear Sights are all about a smooth use and precision function. Their compact size truly does allow for the use of multiple other accessories, even if you want to use this set on firearms with a shorter barrel. If you’re interested in keeping your AR-15 as compact as possible, then these are the best AR iron sights for you. You should get many years of use out of this investment, which is good, because they cost a pretty penny. What we say – The Bobro Engineering Low Rider Front and Rear Flip Up Sights are the most expensive on our list. You can purchase them individually for just over half the price each. We do suggest that if you can spare the extra dough, go for the pair, as it will save you a little bit of money in the end. This is definitely the best option for you if you’re interested in high end and high quality BUIS. 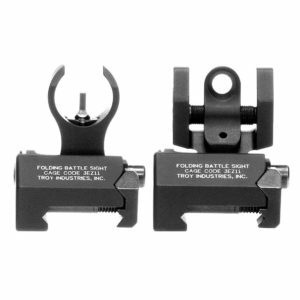 Our top pick for the best flip up sights for AR-15 rifles is the Troy Industries Micro Front and Rear Sights. The pair together still isn’t really budget friendly, but they’re slightly cheaper than the Bobro Engineering Low Rider set. We really like the special locking detent balls because the last thing we need while firing a rifle is for our backup sights to start rocking back and forth or flopping around. Despite the larger aperture on the rear sight, both the front and rear are still both entirely functional and effective. Finally, you’ll hardly need to adjust for elevation, as they come at factory iron sight height. We highly recommend looking into the Troy Industries Micro Front and Rear Sights.